# 1 Use of force- traditional arts such as Ju Jitsu, Karate, Tae Kwon Do, and Kung Fu are often rooted in the need to survive the battlefield. Often they were adapted to combat between clans and gangs. Even as they survive today in practice and tournament, they have rules and the winner is declared by points. In martial history, only quite recently have we had to defend our actions when it comes to physically defending ourselves. Most people teaching traditional martial arts in the US have never been employed in a custodial capacity in which putting hands on someone requires justification and paperwork. Here at MCS that is the background of all of our instructors. For that reason, the teaching and comprehension of use of force is a cornerstone of the curriculum. You may have heard many forum and gun show experts say, "I would rather be tried by 12 than carried by six". That may be all well and good, but the truth is that many self defense situations never escalate to the deadly force level. Using too much force is likely to result in you ending up in both criminal and civil court. We teach you how to justify your actions to everyone from your Sergeant to your attorney depending on whether your use of force occurred under professional or private circumstances. For the professional, we even discuss effective report writing. # 2 No uniforms- for years we have had the "no training costume rules". If you see an MCS instructor out in the street, there is a good chance you will see them wearing the same thing in class. The only difference is that we change out our real weapons for training weapons including Blue Guns and training knives. There are no Gis, there are no belts, there are no costumes. However, you may wear whatever you wish. You are training for your reality, not ours. Several years ago I had the opportunity to attend a course at a Krav Maga studio, "Krav" is well known for its realism. When the staff saw me walk onto the mat wearing a Blue Gun and training knives, they freaked out and I was asked to take them off. I complied and never went back. This may not be true of all Krav Maga schools, but seemed more like a policy than preference to me. #3 No ranks- in MCS there are no ranks. As a matter of fact, all you have is students and instructors. There are currently five active instructors, including myself and two more at large around the US. The title of MCS instructor cannot be purchased and there is no certificate for it. All instructors have been chosen by me based on first their character, willingness to teach others, depth of knowledge, and their history of successfully working in chaotic and violent environments from working the street as a cop to working the door as a bouncer. All MCS instructors are humble and have nothing to prove, as well as detesting those that do. #4 We train the hard things first- if you walk into any dojo and tell them you are interested in learning how to defend yourself against edged weapons, they are likely to tell you one of two things: either that they don't teach edged weapons, or that it is advanced. The reason is that many traditional arts, with the exception of Escrima and Kali, only dabble in edged weapons, if they cover them at all. 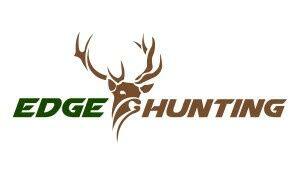 At contact distance a knife is much deadlier than a pistol. 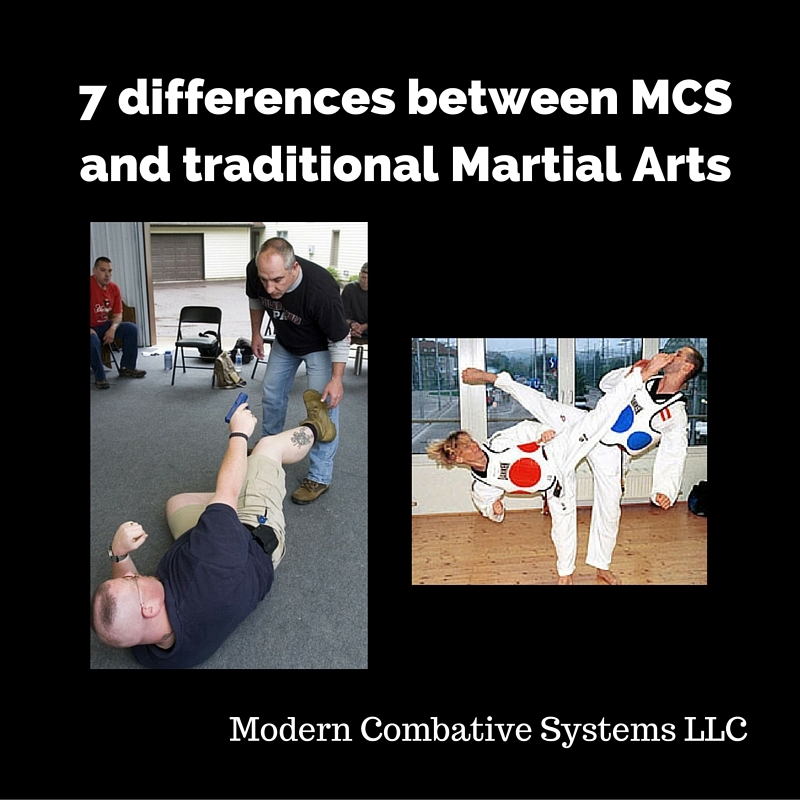 Here at MCS, defending against edged weapons is the foundation of our open hand combative because we believe that every empty hand is concealing an edged weapon you do not yet see. This is why we concentrate on moving to the outside, controlling the attacking arm above and below the elbow, while simultaneously attacking the head, elbows, and knees. #5 Weapons- While some traditional arts use cultural weapons such as the staff, kamas, swords, nunchucks etc, we use the weapons of our culture, the folding knife, stick/cane, and pistol. 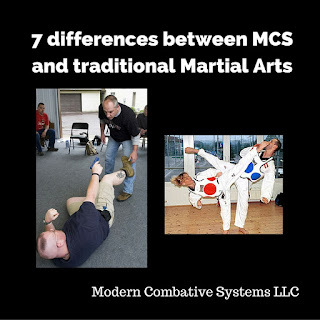 Even though the foundation of MCS is open hand combatives consisting of the three phases of combat; punches and kicks, take downs, and throws, and ground control, we work the both the defensive and offensive use of weapons. #6 No rules- I usually explain this by saying, "If you cannot do it in the ring, then it should be one of the first things you go to in the street". There is really no such thing as fighting fair or dirty. There is only fighting and that is what we teach. #7 Aggression is the last option- Most time spent in a traditional Dojo is dedicated to physical skills, often complicated with little to no discussion on their probable effect on an attacker. MCS has three phases: Awareness, Avoidance, and Aggression. Of course ambushes happen, but most of the time the need for aggression is based on the failure of your awareness or avoidance skills. It comes as a result of being backed into a physical or psychological corner. At that point there is no time to attempt or try things. Your physical skills must be explosive, direct, and effective. They cannot rely on the attacker's ability to feel pain. They have to have a very high probability of success in unknown circumstances. Lastly, I want to say that we respect all traditional arts and our instructors have participated in Judo, Ju Jitsu, Karate, Tang Soo Do, Kenjitsu, boxing, wrestling, Kali, Escrima, and fencing. What we don't respect are watered down American McDojos that are more concerned with after school programs and tournaments and trophies instead of preparing students for the reality of a violent encounter. If MCS sounds like something you would like to be involved in, consider visiting our school in York PA or contact us about hosting a school anywhere in the country. We want to share what we have learned.